Chicago, Il – Elephant Room is excited to produce another off-site exhibition at R. Hanel Gallery located at 119 N Peoria St, #3A in the West Loop. 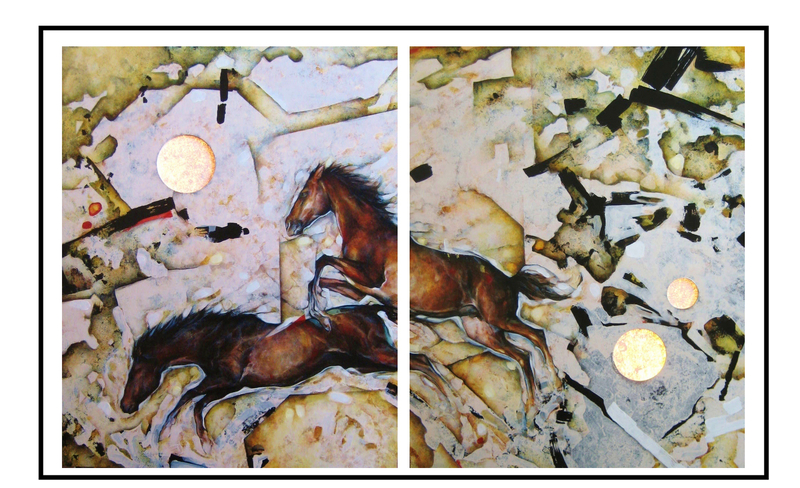 “Breaking the Line” is an exhibition of paintings and drawings by Keelan McMorrow that will be on exhibition through the weekend of April 26th. The exhibition starts with an opening reception on Friday, April 26th from 6 to 10pm. Additional viewing hours will be on Saturday, April 27th from 11am to 5pm and Sunday, April 28th from 11am to 3pm. An artist talk with McMorrow will occur on Saturday, April 27th at 2pm. R. Hanel Gallery is a spacious West Loop loft that is the ideal space for artistic expression. The opening reception of “Breaking the Line” will include a silent art auction of one of McMorrow’s newest works as well as music provided by DJs Benny Hernandez and Erick Jiminez. Light fare and drinks will be served along with the opportunity to meet the artist, view and purchase both larger scale paintings and unique, framed drawings by McMorrow. At first glance, McMorrow’s paintings seem decidedly figurative. Well-rendered articulations of life and limb are at focus, altogether vibrant and encapsulated, and the artist knows his craft well enough to make you believe it. But these aren’t your average portraits, and the renderings stop once we’ve been led to believe in them. The overall effect is almost hieroglyphic in nature, as the spaces that weave themselves around such recognizable things as human flesh become liquid and rigid, pensive and bold. McMorrow is an innovative painter as he attempts to turn the mundane into archetype. 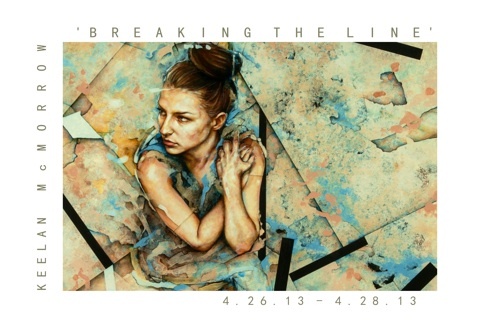 “Breaking the Line” is an exhibition of work that highlights these attempts. Some seem nearly architectural in nature, others burst like ruptured paint cans and a few even incorporate electrical light sources installed within the pieces themselves, experiemental but rooted in the Western tradition of craft and composed diligence. Keelan McMorrow is among a group of relevant artists today that are both experimental in their ideas and technically proficient in their craft. “Breaking the Line” should not be missed!